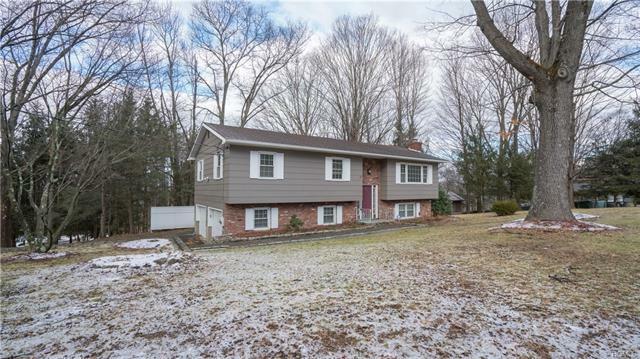 WELCOME HOME - Recently renovated Raised Ranch located in the Wallkill School District. Features 3 nice-sized bedrooms, 2 full baths, gleaming hardwood floors thru-out, large kitchen with stainless steel appliances, granite counter tops, new lighting fixtures, porcelain tiled flooring. An added bonus of a three-season porch overlooking rear yard perfect for entertaining family and guests. Lower level has a beautiful brick wood-burning fireplace, family room with wet bar area, private full bath, laundry room, sliding doors leading to patio area and large side yard with a shed. Perfect mother/daughter set-up for in-laws or extended family. Two car garage with hassle free generator transfer switch. New central air, new gutters and beautiful stone retaining wall. Located just minutes to I-84, Thruway, Newburgh/Beacon Bridge, commuter transportation to NYC.